Hello and Happy New Year! I’m back, and thankful that after a 3-Saturday break, you’re here reading today! I never, and I mean ever, watch reality TV. In fact, we really don’t watch that much TV at all but reality shows, no way! But then yesterday, I was about to cue up a favorite episode of Miss Fisher’s Murder Mysteries when I saw the new Netflix reality show with the adorable and evanescent organizational guru Marie Kondo was being advertised. I had no desire to see people getting emotional over their closets or hear them bicker over the dirty dishes, but I was curious about seeing Marie in action, so I tuned in for an episode. Marie Kondo, feeling a spark of joy from her sweater. The YouTube video explains. If it doesn’t spark joy, get rid of it. b) They’ve been in their “Forever Home” for a while now, and they’ve accumulated even more furniture …. but they don’t like any of it! They kept buying things to fill the gaps, one-off purchases that were the right price but were never the right piece. Now, nothing goes together, and their “Forever Home” doesn’t feel like Home at all! Together, we assess their “givens” — the things they have, the house they’re in, and what they want to achieve in their vision for their “Forever Home.” Then we come up with a plan that fits that vision and determine if any of their current furnishings fit into it. There can be HUGE GUILT associated with throwing or giving away furniture and decor that homeowners don’t like, may never have liked, etc., because it is still serviceable. My client had gotten a lot of hand-me-down furniture from her mother and other siblings. We went through what was worth keeping and what wasn’t — and when I say worth keeping, I really mean we decided what could fit into a design plan that, overall, gave the homeowner joy and pride in her home. If it didn’t fit the design plan she wanted, we didn’t use it. 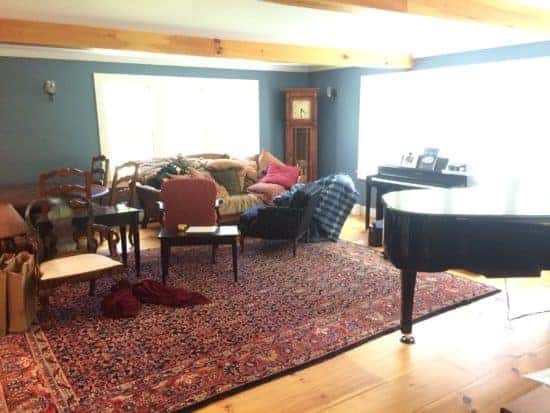 She even decided NOT to use the big rug — when push came to shove, it gave her no joy, and the decorating scheme that could have incorporated it gave her no joy. The blue walls — those gave her joy. They stayed. Now, there were definitely things I encouraged her to keep! Her mother’s beautiful Chippendale dining room set and another Oriental rug were able to be worked into her overall house plan seamlessly. Moreover, we were able to pull her treasured black & white photo art that her father had given her from a less used part of the house to where it would now be a focal point in her main entertaining room. Marie tells her clients to thank the items they are no longer keeping (usually clothes they never wear) for letting themselves be used, and then to let them go without guilt or shame. I think more DIY decorators need to be investor-savvy, recognize sunk costs in their home decor, and move on without shame. Too often, I see them throwing good money after bad, trying to make a mistake purchase work. Not infrequently, these poor DIY decorators are pressured by a significant other — this is the same significant other who thinks that decorating is easy and doesn’t merit being done by a professional — to make the mistake purchase work, come hell or high water, or live with it for the rest of their lives. Bluntly put, 9 times out of 10, if you decorate around a mistake purchase, you will regret your whole scheme. The most popular blog post I have ever written, hands down, is this post on why your gray room turned blue, green, or purple and how to fix it. In it, one of my earliest distance clients had had the interior of her house painted prior to moving in, before she knew to consider how colors play with lighting, exposure, etc. While most of her home had neutrals with warm undertones throughout, she unwittingly had the ground floor painted a gray with a blue undertone, an blue that was exacerbated by the room’s northern exposure. By the time she got around to furnishing the space, she had recognized the mistake. Now, paint is an easier thing to change, but it still costs money. If she wanted to change it to make everything feel right, she would have to consider that original paint job a sunk cost. We chose a different paint color, keeping it on hold, and then kept decorating, seeing how she felt about living with the original, vs. having it redone. Then she sent me a progress pic. But the blue undertone kept bothering her, so she finally decided to repaint the room. Update below. And now her family room sparks joy! Art is from Parima Studio. End table and sconces. Pillows and sectional are custom. Rug is a vintage Tufenkian from Ebay. Mistakes happen when you decorate without a plan, or have only a vague notion of a plan. I finally finished Thing 2’s room a few months ago. I definitely dawdled in getting it done, little bit by little bit, but I always knew how it would turn out because I took the time to make a plan. I’ll do a before & after reveal in the future, but here’s a sneak peek. Paralyzed by Fear & Overwhelm? Just as Marie’s organizational clients are overwhelmed by their clutter and don’t know where to begin, so many homeowners are overwhelmed and don’t know where to begin with decorating, just like the clients who call me. So take heart! If this is you, you aren’t alone. If you need help, GET IT!! There’s no shame. And if you contact Home Glow, I promise not to judge. 😉 See my service options. Heck, I’m clueless when it comes to clothes, so I get help! I order clothes from Stitch Fix (click the link for a $25 credit on a first-time order) and get “capsule wardrobe guides” from ClassyYetTrendy. Money well spent, IMO. If you have hand-me-down decor and you’re debating if you should keep it or let it go, some of these posts may interest you. Do you have any hand-me-down furniture that’s been following you for decades? Any decor mistakes that you’re having a hard time letting go of? The Handsome Husband can definitely rattle off a few of mine from my earlier days, and I still occasionally make an impulse buy that I regret — and I’m a decorator! It’s good to have you back! My husband and I are about to do some bathroom/closet remodeling which will necessitate clearing out all of our closets and shifting things around after raising 5 children and being married for 42 years…I needed to read this!